Bank of England John Soane 1794-1810 London. 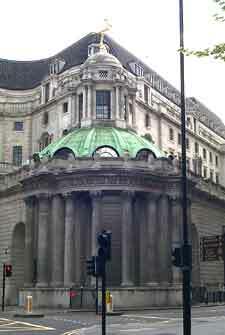 Affectionately known as ‘The Old Lady of Threadneedle Street ‘, the Bank of England has been through several incarnations in its three – hundred year history. Now a large and imposing edifice sprawling over four acres of the City, the original bank opened for business in 1694 in the Mercers’ Hall later moving on to the Grocers’ Hall. Finally, in 1732, the present site was bought and work began on the buildings which form the back of the present court towards Threadneedle Street. Extended and rebuilt several times over the centuries, much of what is visible of the bank today owes its design to Sir John Soane. In fact, one of its most famous features, the stately colonnade which forms the North West or ‘Tivoli’ corner (pictured above), was based on the Temple of Vesta at Tivoli which the architect sketched in 1779. The interior of Soane’s bank was demolished in the 1920 ‘s, leaving only the massive enclosing wall that had been constructed for security and privacy. But the then architect, Sir Herbert Baker, was careful to incorporate both Soane ‘s designs and those by an earlier architect, Sir Robert Taylor, into the new building. As a result, the parlours, as the bank ‘s workrooms are known, retain their authentic feel.